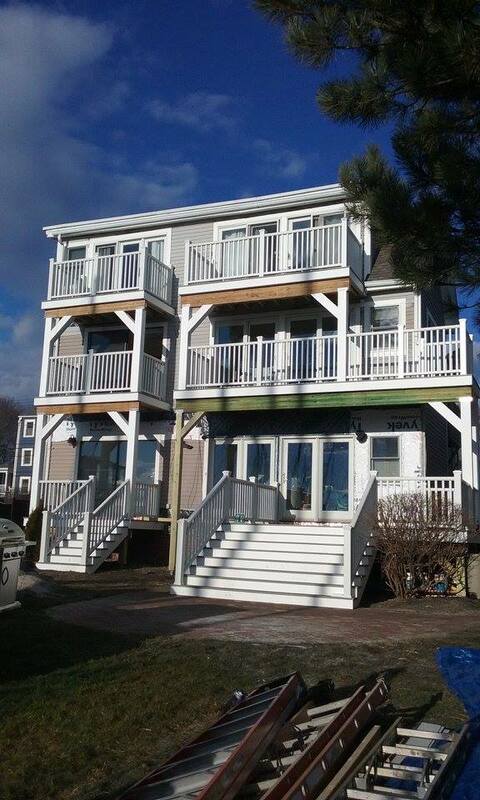 The condominium association contacted us because their large multilevel property had aged, weakened decks on the seacoast. Since the repairs were delayed to long, significant water infiltration and rot repair was discovered. 6 decks ranging in size had deteriorated beyond repair requiring total replacement. We performed extensive structural frame repairs, requiring removal and re-installation of all doors, windows and siding bringing everything up to current standards and practices. The result was a 3 story high/6 deck beauty with Trex Deck in Gravel Path decking and Trex Transcend railings. We used pressure treated structural beams (LVL’s) to support the 3 story high structures working closely with the local building officials. We would happily work with this homeowner again.